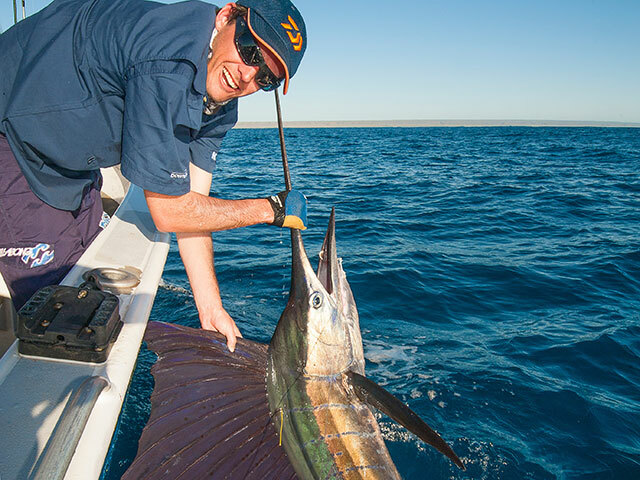 The remote Australian outpost of Exmouth offers world-class blue-water fishing for marlin, sailfish and more..
Small black marlin in the 20- to 80-kg size range are the mainstay of Exmouth's billfishery and are available year round. The area also experiences a reliable run of blue marlin during the Australian summer months. With the Continental Shelf lying as little as eight kilometres from shore, even small trailerboats have no trouble accessing this superb fishery. Photos by Ben Knaggs. Two distinct runs of sailfish occur through late winter and spring in Exmouth's inshore waters. The larger fish are typically found on the western, oceanic side of North West Cape, while bigger numbers of smaller sails invade the shallow, protected waters of the Exmouth Gulf. This FishTrack SST shot shows a number of prominent fish-attracting temperature breaks along the edge of the Ningaloo Reef and Continental Shelf. Mahimahi are the major bycatch when chasing billfish off Exmouth. They can be so thick at times that they're a nuisance when your focusing on marlin, but mahi are great fun on light gear. Surface-feeding schools of longtail and mack tuna are rarely hard to find in Exmouth Gulf. Getting within casting range of these fish can be challenging, but when it all comes together this is the champagne of light-tackle sportfishing. Cobia regularly turn up in Exmouth Gulf in good numbers. Sight casting to these fish under manta rays through early spring is a real treat. Big giant trevally patrol the wash zone of Ningaloo Reef. Chasing them with poppers and stickbaits can provide some high-velocity fishing. 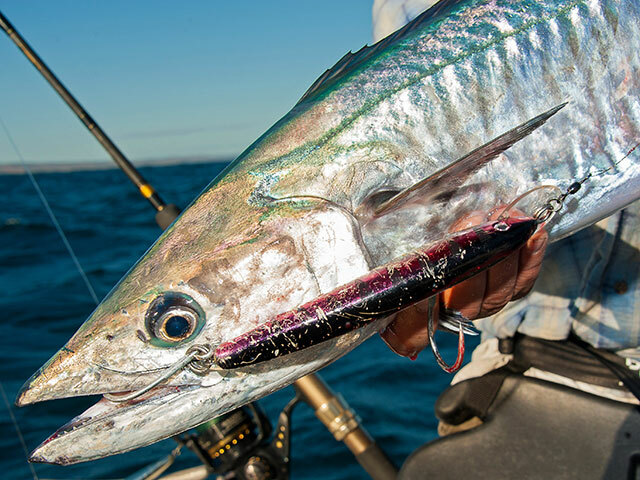 Trolling high-speed diving minnows along the 30-meter depth line just beyond the edge of Ningaloo Reef is a sure fire way to connect to Spanish mackerel. Unfortunately, sharks will take more than their share. August until November is the time to fish the western side of North West Cape for packs of sails that move in along the edge of the Ningaloo Reef. These tend to be nice-sized sailfish by Aussie standards, rarely dipping below 20 kg and often exceeding 40 kg. The Australian outpost of Exmouth delivers big numbers of billfish and more. This tiny town, located on the sparsely populated, burning shore of Western Australia continues to build a reputation for world-class sport fishing. 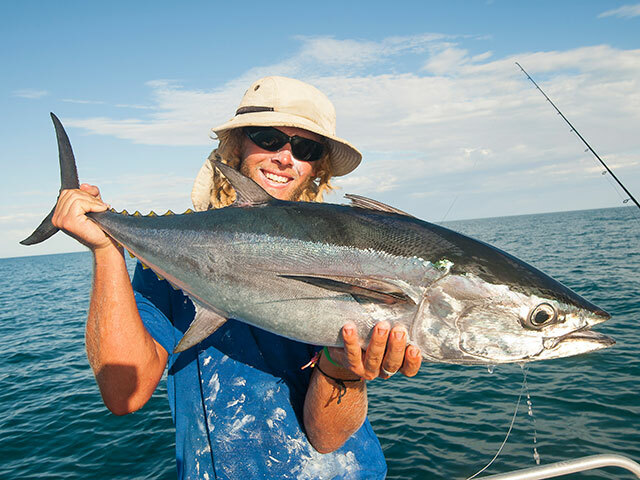 Exmouth’s fishing options are truly astounding, thanks largely to a near perfect geographical location and conditions that suit almost all of Australia’s major game fish. 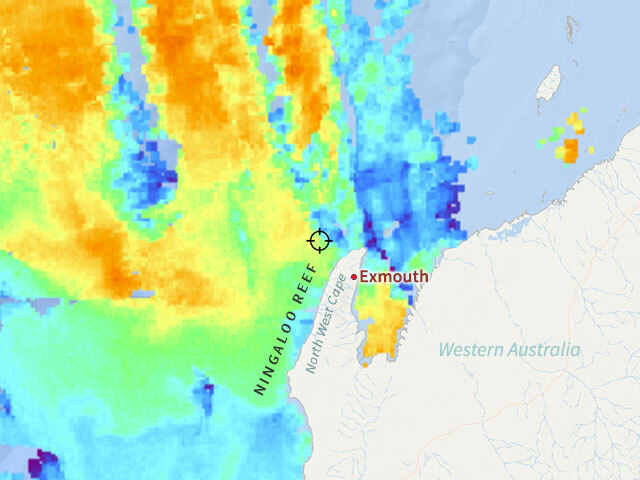 It’s almost as if Exmouth was custom designed for the sport fisherman. Exmouth’s location on the North West Cape -- a slight spur of land jutting out from the western edge of the continent -- offers superb access to the canyon-riddled Continental Shelf. With the Shelf as close as eight kilometers, even smaller boats are able to make the offshore run to the very fishy waters of the Indian Ocean. The North West Cape itself is ringed by the World Heritage-listed Ningaloo Reef, which stretches some 300 km south along the coast. While the lagoon creates a magnet for snorkelers, anglers usually aim for the edge of the reef, which is inhabited by a variety of pelagics. 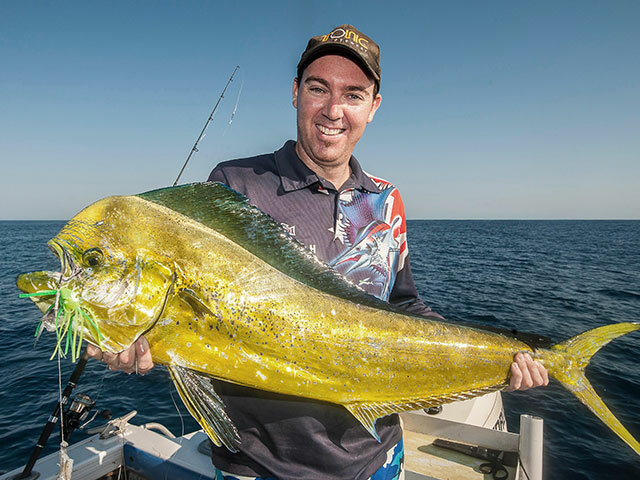 On the eastern side of North West Cape sits Exmouth Gulf, which provides a refuge during periods of strong winds and a diverse and exciting fishery of its own. The Gulf almost acts like a funnel to the southward flow of the Leeuwin Current, and is loaded with all manner of game fish. Exmouth’s headline act is undoubtedly its billfishery. The area is certainly one of Australia’s premier billfish hot spots in terms of numbers and year-round availability of fish. All six Australian billfish species can be caught off Exmouth, and most with a degree of consistency rarely seen in other locales. 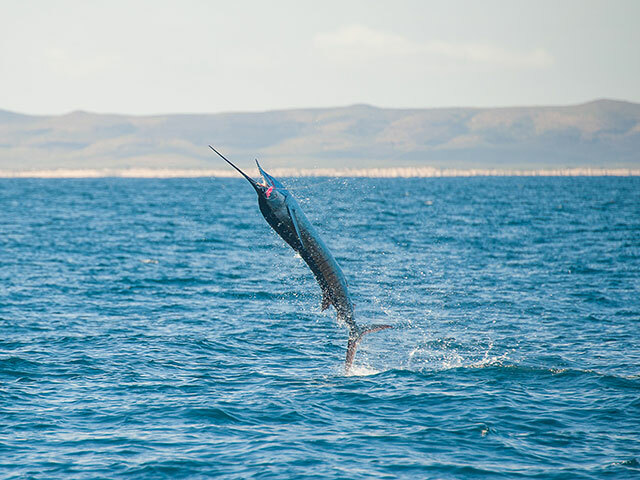 The bulk of billfish found off Exmouth are black marlin, which are available year round but at their best from mid-summer to late autumn (February to May). Black marlin can be found along the western, oceanic side of North West Cape, from the continental shelf edge to the 50-meter line. While most are juveniles, bigger blacks beyond 200 kg turn up each year in these same areas. Numbers of these smaller blacks can be ridiculous at times, with 10-fish days common. Sailfish are also prolific and available year round, with two distinct peak times for what appear to be two separate local stocks of sails. August until November is the time to fish the western side of North West Cape for packs of sails that move in along the edge of the Ningaloo Reef. These tend to be nice-sized sailfish by Aussie standards, rarely dipping below 20 kg and often exceeding 40 kg. 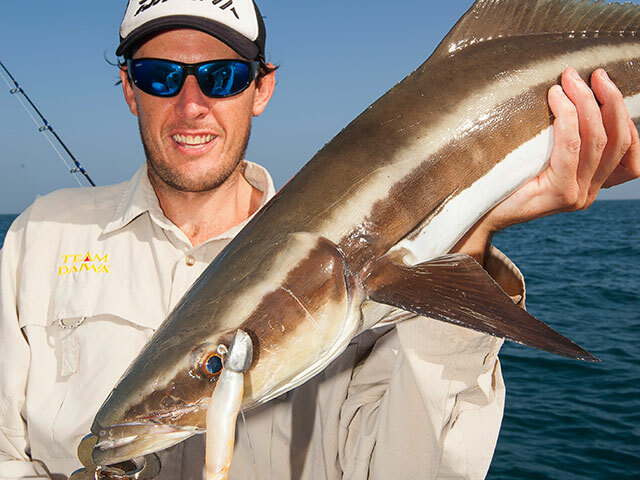 Expect double-digit shots every day by switch-baiting or trolling skipping garfish in 50- to 100 meters of water. A strong run of smaller sails in the 10- to 20-kg range push into Exmouth Gulf to feed on big schools of a local herring species colloquially referred to as “gulf mulies” in October and November. Crazy numbers of sails can be found strafing these dense baitballs, and pitching live baits is a sure-fire way to rack up the tag cards. In recent seasons, some local skippers tagged over 30 sails a day when the gulf mulies are thick. The heavy tackle slice of Exmouth’s billfish banquet is the summertime (December to February) run of blue marlin along and outside the Continental Shelf edge. Rarely will you find a location that can offer such reliable numbers of blue marlin. The average size of Exmouth blues is 100 to 200 kg, but bigger fish are frequently hooked and every single crew that regularly fishes for them off Exmouth invariably has a story of getting smoked by a monster. With more crews targeting blues than ever before, the first Exmouth grander blue may be caught any day now. Midsized striped marlin also get in on the act when fishing the shelf and wider for blues. The majority of these spectacular billfish are encountered through early summer when there are a greater number of boats out looking for blues. Fluctuations in the southward-flowing Leeuwin Current dictate when and where most of Exmouth’s billfish will show. While the convoluted undersea terrain along the Continental Shelf edge is a magnet for blues, current features including eddies and temperature breaks will stack them up, and if you follow the satellite charts keenly you can enjoy some mind blowing days of world-class heavy-tackle fishing. "Exmouth's headline act is undoubtedly its billfishery. The area is certainly one of Australia's premier billfish hot spots in terms of numbers and year-round availability of fish." Dolphin (mahimahi) run so thick off Exmouth that they can be a nuisance at times. Wahoo can turn up anywhere from the shelf right through to the back of the reef, and a smattering of yellowfin tuna – including some barrels approaching the 100-kg mark – delight crews chasing billfish. 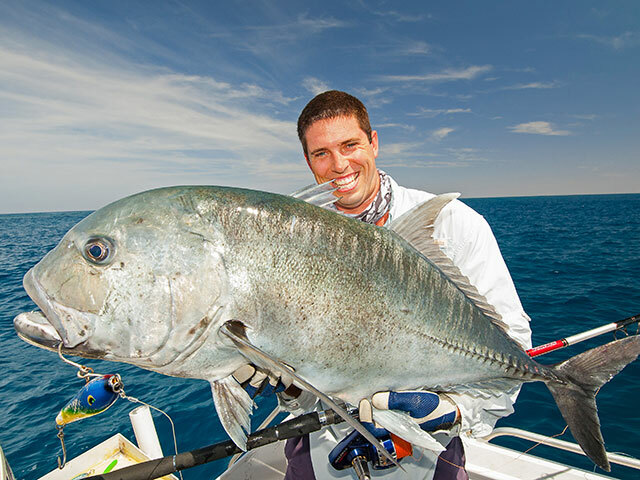 Back inshore, the edge of the Ningaloo Reef is home to good numbers of giant trevally, which will run down stickbaits and poppers cast right on the edge or around bait schools. There’s also an exhaustive list of other trevally species in Exmouth waters, perhaps topped by golden trevally up to and even over 15 kg. Perennially underrated, goldens rival the more highly regarded GTs in terms of pulling power once they breach the 10-kilo mark. The reef edge is also a hot spot for Spanish mackerel, especially during the winter months (June to August) when huge mack packs gather and linger along the 30-meter drop-off just outside the reef. Troll high-speed diving minnows or cast stickbaits for a shot at macks in the 10- to 15-kg range, with the occasional 20-kg trophy thrown in. Moving across the Cape, the shallow, relatively protected Exmouth Gulf offers a fantastic playground for fishos keen on lighter-tackle pursuits. Aside from the sailfish run, the Gulf offers year round opportunity to cast to schools of surface-feeding longtail tuna and tough mackerel tuna (kawakawa). These fish can be very flighty and hard to approach, but are great fun on light tackle. Cobia, golden trevally, Spanish mackerel, queenfish and more also haunt the Gulf, and this area can offer a handy option when the west side is blown out. 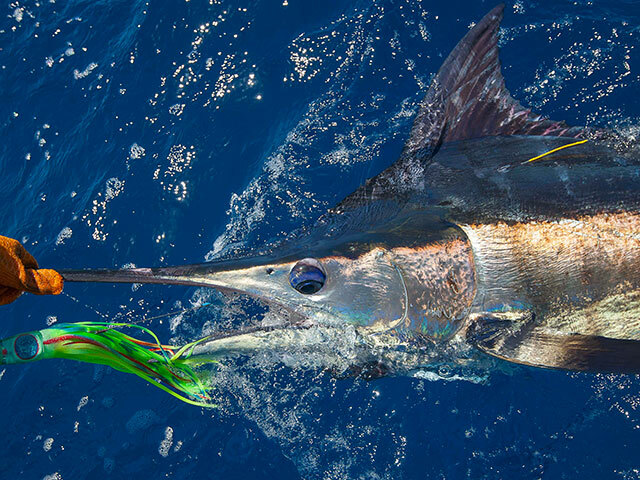 There’s also an untouched and slowly emerging fishery for the ever-elusive broadbill swordfish, using both ‘traditional’ night time techniques and the more modern daytime deep-drop approach. Despite its small population, Exmouth boasts excellent facilities for local and visiting fishos. Three boat ramps provide direct access to the Gulf and offshore beyond the Ningaloo Reef, and a small but high-class charter fleet headed by Capt. Eddy Lawler of Peak Sportfishing and Capt. Josh Bruynzeel of On Strike Charters service the many anglers who choose to fly in. The sailfish is a hardy customer and recent acoustical tagging and tracking experiments show that this species has a very high survival rate when released. To do your part, fish with circle hooks and don’t yank the fish out of the water for a photo.